The Surrey Cricket Foundation offer two types of affiliation - Core Affiliation and Friend of Surrey Cricket - which allow your club to become part of the Surrey family and access a wide range of benefits. 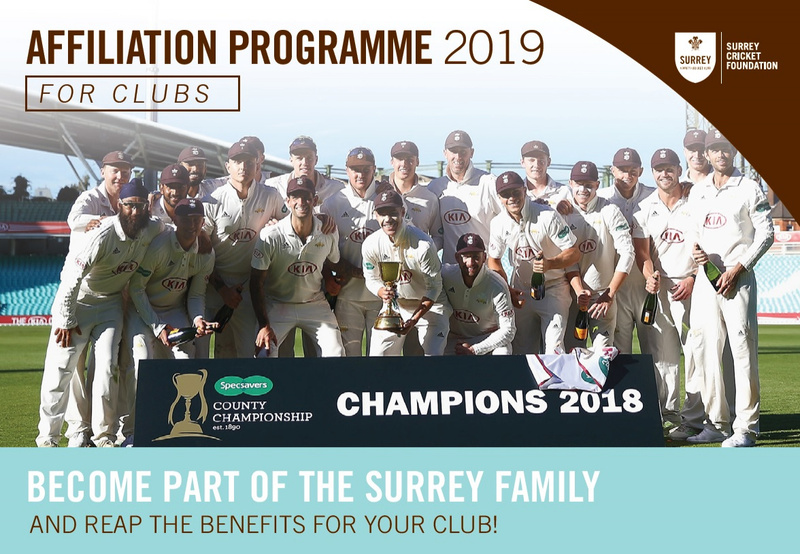 From free tickets to T20s and One-Day games to signed memorabilia, store discounts and county board support, the benefits are designed to keep your club at the heart of the action in Surrey. With Core Affiliation starting at just £25 and Friend of Surrey Cricket at £200, there's a programme to suit your club's needs. Click the tabs on the left hand side or view the brochure at the bottom of this page to find out more information on our affiliation programmes. Please note that clubs from the following leagues are automatically affiliated at core level by their respective league. This means that clubs signing up to Friends of Surrey Cricket from the above leagues only need to pay £175. Clubs playing friendly cricket or in any other local league (I'Anson, Village, South London Sunday, British Tamil League etc) would need to pay £200. For more information, please contact Katie Baker via email.